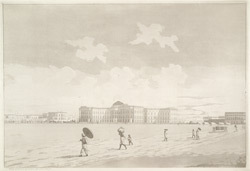 Aquatint of the south east view of the New Government House at Calcutta by James Moffat (1775-1815) published in Calcutta in 1803. When Marquess Wellesley became the Governor-General of Calcutta in 1798, he decided that the existing Government House was not a suitable building for his position and needs. The architect of the new Government House, Captain Charles Wyatt of the Bengal Engineers, based his designs on Kedleston Hall in Derbyshire. This view shows three of the four projecting wings of the building. On the left, we can see the central feature of the southern façade; a circular colonnade with a dome. The architectural style of the new Government House is Neo-Classical.